I read an article earlier this week, which informed me that I was almost at the point where I would be considered “mid-career.” I quickly dismissed this with disgust since for one, grad school was just yesterday, and furthermore I still consider myself young, hip and fresh in the field. Who wants to play pop up pirate with a “mid-career” therapist? I thought about it for a bit, and decided it meant that maybe, just possibly, I might be able to share a few choice words of wisdom about what I’ve learnt along the way as I hit my 8th year (see not that bad) of practice. I’ve spent all of those years building a private practice. However in Barbados, where you’re one of four speech pathologists it means that you’re also a school SLP, medical SLP, community SLP… and the list goes on. Needless to say I’ve learnt a few things in each area thus far. The key topic that pops up weekly in conversations with colleagues and interns is “avoiding BURNOUT.” Yes that dreaded "B" word that can creep up on even the best of us. Disclaimer: I in no way consider myself an expert in the field. I still struggle with clients, still have mini panic attacks when I think about scheduling and caseload management, still suffer from imposter syndrome sometimes, still have to google SLP terminology or “phone a friend,” still some days fantasize about marrying filthy rich and sailing away from paperwork mountains on a massive yacht…but I digress. The important thing is that I’m still here, and still loving what I do every step of the way. What are my tips for waking up every most mornings still excited to go to work? Sessions can get boring very quickly, not only for your clients, but for you as well. I don’t know a single therapist who has said “I can’t wait to use those same flashcards in therapy for the 10th time!” Fortunately for our field the SLP world has taken over technology, and the internet is filled with a plethora of blog posts, pinterest ideas, TPT stores and other wonderful places, that place creative new ways to hit your targets at your fingertips. Also remember you’re not limited to your therapy room (I feel claustrophobic in clinic after a while). Take it outdoors, to the playground, to the supermarket, even to the corridor or another room. A small change of scenery goes a long way. Speaking of a change of scenery….. Yes I said step away from the laminator and book a trip somewhere. It could be to a convention or continuing education course, where you have the opportunity to network with likeminded professionals and come back to work with fresh ideas and new skills to use with your clients. It could also be just a quick trip somewhere to clear your head and regroup. I find that I get the best ideas and make the clearest decisions for my practice when I’m as far away as possible from said practice. 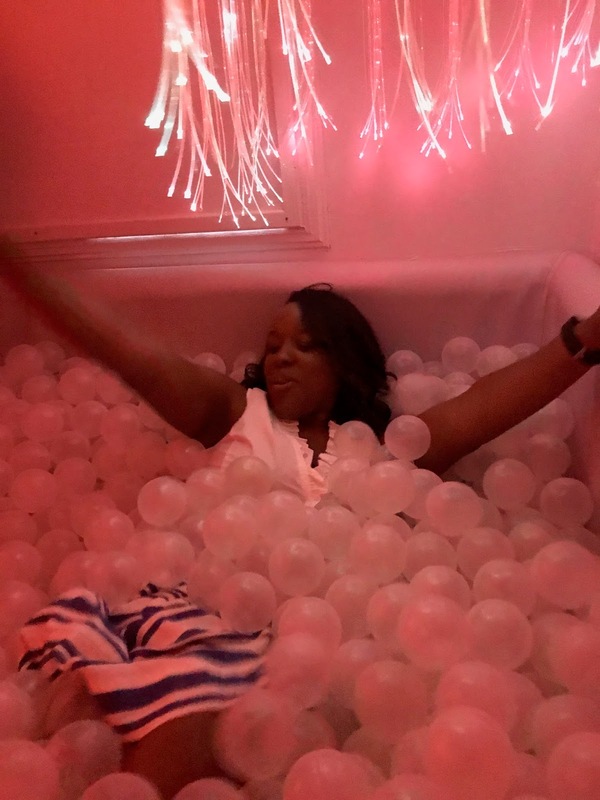 Sometimes we get so bogged down and caught up in everything that is happening with our caseload that we don’t have time for brainstorming or problem solving, and we end up digging ourselves into a burnout hole. Trust me…step away for a bit. I cannot tell you the last time I have filled out an insurance form, written a receipt, or touched a laminator. These are all things that had to be done on my own when I first started work. However, as soon as I could find someone to delegate admin type work to, that was quickly passed off so I could focus on doing therapy. I’m also working on passing on certain clients and tasks to my newgrads, as soon as I decide that they are competent enough to manage. I will admit that it is extremely hard to do, especially if you’re used to managing everything, but it definitely makes life easier. You do not have to oversee every visual timetable printed! I’ve been a clinical supervisor for just about four years now, and though there are some interns who make me pull my hair out, having them always makes me see my work from a fresh new perspective. Furthermore, they usually come with the latest research and therapy ideas, and provide new insight into what is current best practice in the academic world. I’ve also realized that every time I talk about, and demonstrate how and why I do what I do I fall in love with the field all over again. This also applies to teacher/parent/paraprofessional training. Sharing your knowledge and skills allows for great moments of self-reflection, critical thinking, and problem solving. Most importantly you are equipping new minds with the tools needed to go out and make an even greater difference in the world. This should be the title of my article. When I left grad school I was so excited to learn everything about everything in the field. In the first years I did Hanen, PROMPT, SOS Feeding, Auditory Verbal, AAC courses, Dysphagia training, and the list goes on. My thinking was that I didn’t want anyone to show up at my clinic, and I didn’t have the skills to help them. Sounds heroic, but not at all practical. I felt like I was dying from information overload, like I wasn’t particularly good at anything, and I started to feel unfulfilled in the field. After a few years (maybe about 6….it was tough) I decided to focus on key areas which I was passionate about and be amazing(ish) at those. The main ones for me have been Autism and Augmentative and Alternative Communication (AAC), which both tie in quite closely. I’ve also been more interested in feeding, but I haven’t delved into it fully. I’m not going to say I don’t do the odd modified barium swallow when needed, or work with a speech sound disorder. However they’re not my primary areas of focus, and I’m hoping that soon I can delegate those too. When I first moved home after grad school I found out what it was like to work in a country with very few therapists, and limited resources. To say it was tough would be an understatement. Remember this was before pinterest and TPT days! I reached out and started doing lots of networking via twitter, where I learnt 100 times more than what I learnt in grad school and picked up quite a few mentors along the way (Mentors are absolutely essential to your practice). It makes no sense (nor is it ethical) fumbling around in the dark and not seeking best practice for your clients. Reach out to the #slpeeps on twitter, the many facebook groups now available for various clinical populations, or the ASHA Special Interest Groups, and ask for whatever support you need. It also doesn’t hurt to email an old lecturer, or someone who did a presentation at a conference/webinar you attended. Trust me it works. Yes I mean you superwoman(man)! I see you balancing that million client caseload, making sure everyone has their visuals, that IEPs and progress reports are submitted; trying to figure out how you’re going to stop in before gym to make sure those parents are really doing family meals for dinner, and sneak out before you have to give advice again on how to get the older brother to do his homework. I know you’re putting your phone on bluetooth on the way to pick up groceries, so you can explain the results of last week’s evaluation, and yes of course you’ll give a talk this weekend at his preschool’s PTA meeting….but wait did you even eat lunch today?? After a few more of those panic attacks I mentioned, I had a conversation with myself one day and said “You cannot be everything to everyone!” It’s impossible, and as much as we want to do everything in our power to help our clients, we have to be something for ourselves….Even if that means saying no sometimes. This does not make you any less of a therapist or any less of a person. It shows that you know your limits, and value your sanity. This is still a work in progress for me, but trust me I’ve gotten so much better at saying “no” in so many ways, I’m no longer feeling like the most overworked person in the world and my life has been a better place because of it. Never, ever forget to have fun; when it stops being fun it means we have to do something to find our magic again. Feel free to share what works for you as well. I think I can safely say that summer is the time that rekindles my love for what I do. It also highlights my appreciation for the flexibility of having my own practice. Instead of packing my suitcases and headed off to the next trip (hopefully that happens in September), the last days of June are spent with my planning team, sitting on the floor of my office trying to think up the most awesome ways to make summer groups functional, interactive, and most importantly FUN. As part of my self diagnosed ADD I absolutely hate to be confined to the clinic, so I try to incorporate as many outdoor activities as possible. Summer groups have been sooooo much fun thus far! 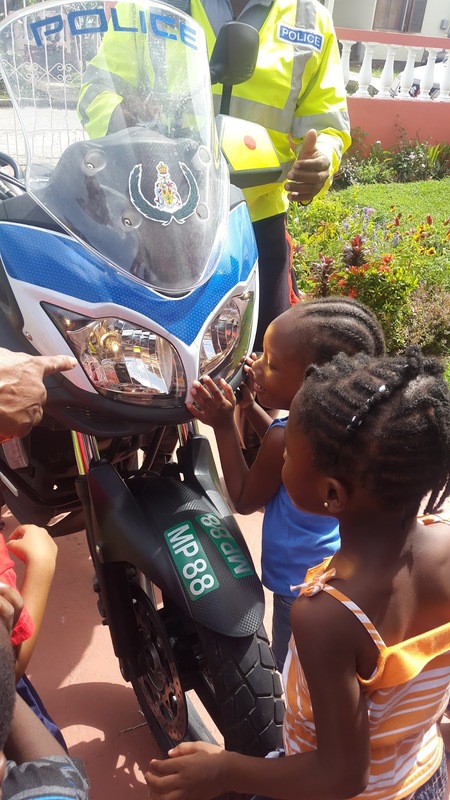 The little ones have been having a blast and really building their language skills and it's such a beautiful thing to watch them shine within the group setting. 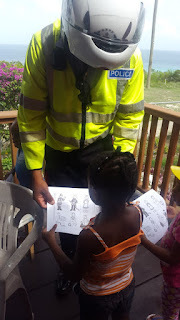 My favorite group activity so far has been our community helpers day with our Language Building. Just before summer started most of the little ones in this group were working individually on community helpers vocabulary, as well as responding to "who" questions. To start the group session we reviewed the community helpers worksheet from Black Sheep Press, and the little ones got a quite a surprise when some of these helpers showed up one by one at the clinic. 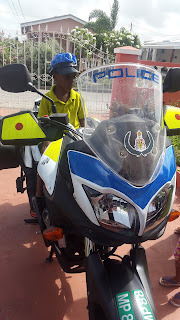 The policeman was clearly an undercover speechie, since he took everyone's worksheet and asked them to point to the policeman, asked them to find the different parts on his bike and shout them out...it was amazing. 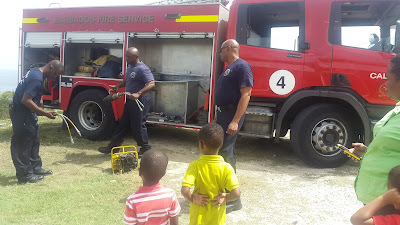 Just when they thought it couldn't get any better, a huge firetruck came around the corner, complete with 3 real life firemen. 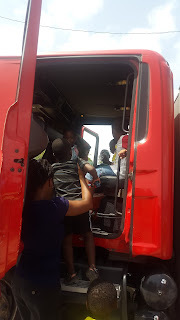 They got to see and label all the different parts of the firetruck, climb on, hear the siren...it was perfect. This speechie was on cloud 9. 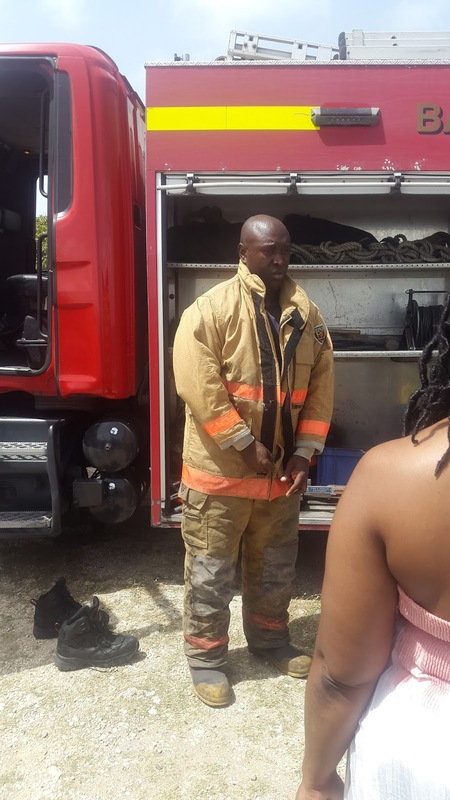 I am so grateful to the members of the Barbados Fire Service and the Royal Barbados Police Force for helping make this happen. It was truly an amazing experience, and language learning opportunity. Stay tuned for more of what's happening in summer groups! 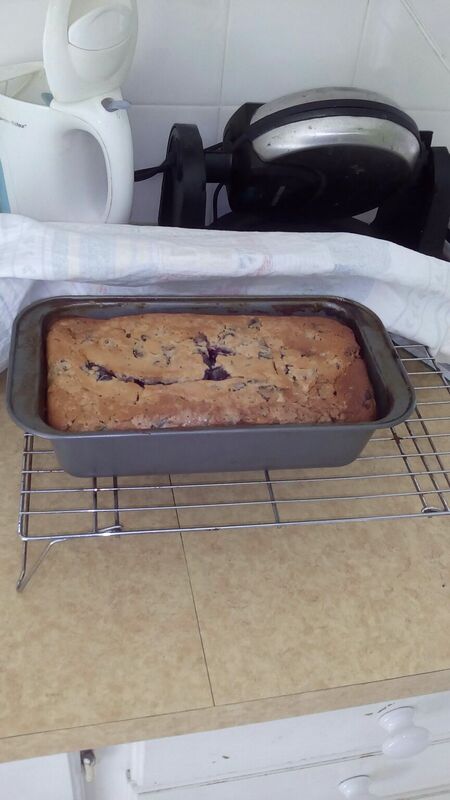 What does Baking have to do with AAC? I've discovered a love for baking. 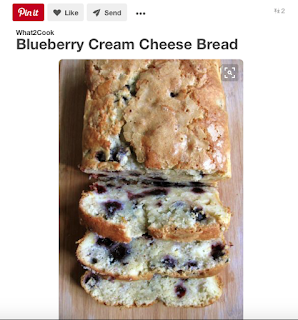 My pinterest page is filled with the most delicious looking cakes, breads, muffins and all sorts of dough filled goodness. I even made the investment and bought a kitchenaid stand mixer a few weeks ago. Now I can't stay out of the kitchen (or the gym for that matter...sigh). It has become a bit therapeutic for me as well. If I have a bad day, I bake. My neighbors and friends are quite happy with this new hobby. My love has also been rekindled for AAC. Don't get me wrong I never stopped using it in my practice; there were just some periods when it all felt a bit overwhelming... However it's important to note as a therapist that when you stop having fun with AAC your clients will as well. So I started having fun with it again. My AAC goals moved away from being focused primarily on choosing specific language/ vocab targets, and became more about fitting those targets into clients' interests. So we started going on treasure hunts, and having afternoon tea....and Baking...yes we started baking. When I first introduced the concept of AAC to an older client about 3 years ago her response was quite a lackluster one. Actually it was more like BLEH! And to be honest I don't blame her. In her shoes I would have had that reaction too. It was boring, it was something new to learn, it wasn't motivating. All I was thinking of then was "Hey, I'm giving you a voice (sounds familiar? ), you should want to use it, right?" Wrong! It wasn't working. We tried a few other things and well...bleh! Then one day I introduced her to pinterest on her iPad, and at that moment the heavens opened up, a light shone down, and I had opened the gates of technology. I followed her, she followed me and she became a "pinmaster" (3.9k pins and counting) Believe it or not Pinterest is one of the greatest forms of communication. I got to learn so much about her interests, aspirations, skills, travels, through this medium. I taught her how to categorize her ideas and findings into boards, homework assignments were being completed, and magic happened. I saw a new motivation appear....I also saw a shared love for food!! I tiptoed in very hesitantly over a few sessions with the "touchchat" app. Slowly introducing it to talk about some of our findings on pinterest, then expanding to other ideas. In this case it was received well. Then I said "let's use it to bake!" and her eyes lit up. We spent the first week choosing the perfect recipe from pinterest. 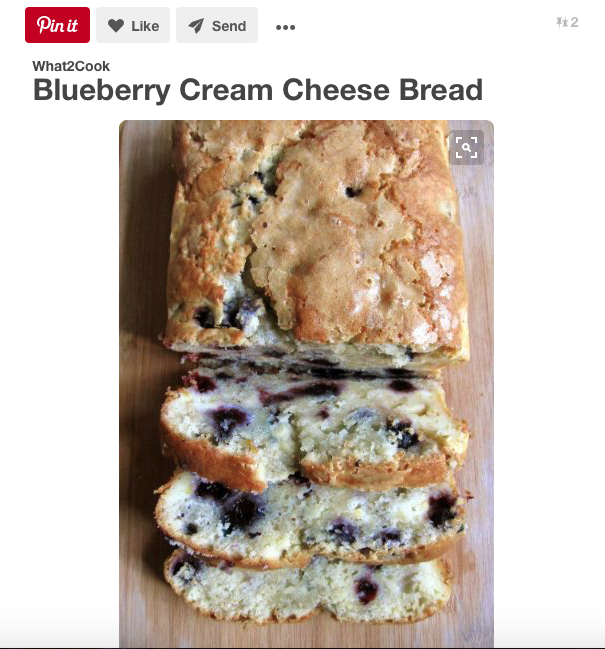 In this case the most mouthwatering blueberry cream cheese bread. After which we worked on navigation of the app to talk about the ingredients and directions for the recipe, and made a shopping list for the family. It was easy to navigate through 1/2 teaspoons and 1/4 cups of ingredients using the app, and I also programmed a separate page called "baking actions", specific to baking activities. 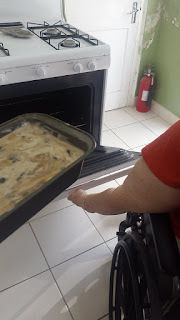 The next session was baking day and the highlight of our therapy. I showed up wearing an apron with iPad in one hand and a whisk in the other, ready for some AAC baking action. 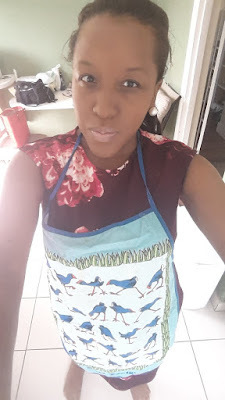 She took the lead as head baker and supervisor, using the device to give directions, and ensure accurate measurements (as well as to ensure I didn't mix up salt for sugar *hide face*). I mixed, beat, stirred, and poured away under the best instruction. 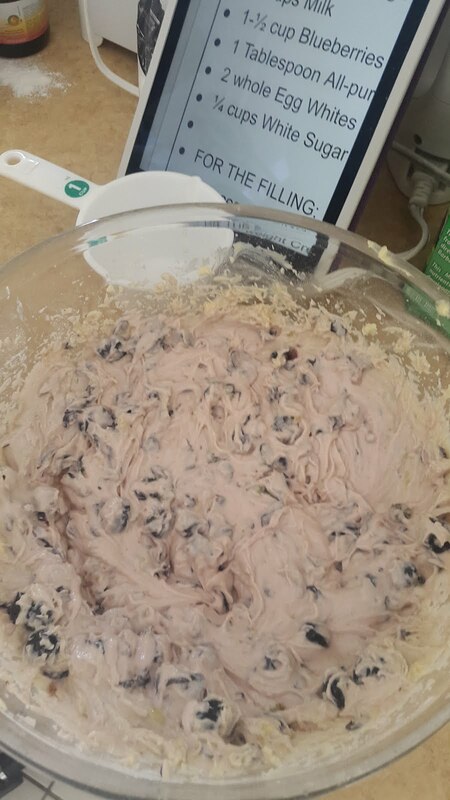 There was also great fun in licking the batter from the bowl. Yumm! Our hard work was definitely worth it, since her willingness to independently use the device to initiate and communicate was amazing, plus the finished product was on point :). So the answer to the title question is Love. 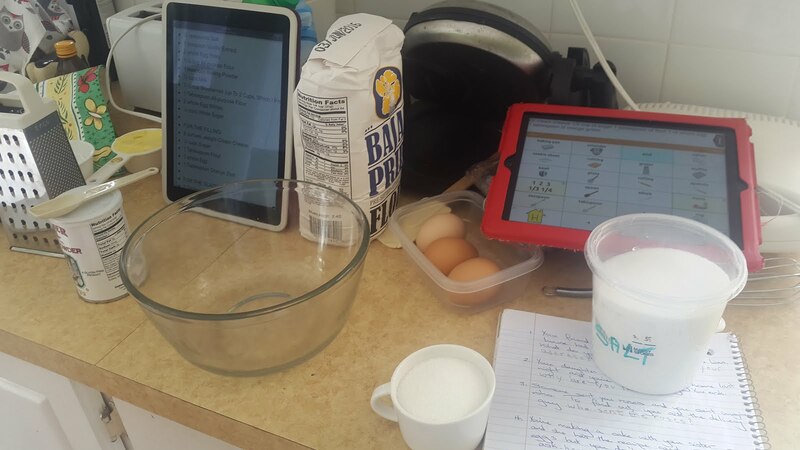 Love is baking delicious goodies, while effectively using AAC for functional awesomeness! I am a huge fan of Scribblenauts. I am absolutely fascinated by the fact that you can type in pretty much anything and they create it instantly and can spend way too much time playing it at home in therapy with my clients. I love the fact that it works on so many language goals, critical thinking and problem solving skills, making inferences, and everything else you want it to do. When I saw a level show up as an "adjective level" I was over the moon. My dilemma came when a little one showed up on Monday demanding Scribblenauts for his artic therapy. Seriously they always want me to be creative on the spot! Anyway I thought for a bit and came up with the photos below to work on his "sh" sound. Honestly I had to thank him for this one, because we have never had so much fun in Artic Therapy. We had great sentence level productions with the "chef on the ship", the "shell that fell on the shark," the "angry shark that attacked the chef" (and killed him.....sorry it got a little violent). He was able to think of his own "sh" words and silly scenarios and we really targeted those sounds. After this session I was so excited to use it all through the week, both in artic therapy and in cycles at single word level. We made pictures for multisyllabic words, velars, clusters, everything. Now I'm hooked. Another fave was my "farm in the forest." The frog in the picture was actually a farmer who got attacked by the evil fairy and got turned into this with the magic wand (not my fault). So I'm loving it. Check it out and use it for articulation & Phono therapy in the free play level. Let me know how it goes! It has been a while since I've done an app review, so when my friends over at Therapy Box asked me to review one of their apps for Speech Therapy I just couldn't say no. It's a perfect app for us speechies as we head into a few months of summer fun, since I personally love summer time to really focus on categorization skills. These are some of the targeted language skills that are great for my summer groups. After a truck unloads the cargo boxes at each station, the train enters for collection, and the goal is to sort the items into two categories, which make up the carriages on the train. What I really like about this app is that you can customize your categories in the "Settings" panel, and chose what comes at each station. The set categories are ocean, weather, fruit, vegetables, animals, transport, kitchen, bathroom, bedroom, tools, shapes, drinks, sports, body parts, plants, toys, cleaning, music, school, house, insects. Plus you have the option of adding your own categories using your personal photos. There is also a button to record your own voice to label each photo. Another useful feature that can be customized when interacting with this app is the type of prompts provided. You can turn on auditory or written cues to add support where necessary. I've been playing so far in "errorless" mode, where if you drop an item into the wrong carriage it will bounce back to the bottom of the screen to let you know that it doesn't belong there. However, there is also the option to turn this off, and then a blue symbol will appear to show which ones do not belong in that category. At the end when all the items are in their correct categories, players are treated to a fireworks display and a "well done" from the conductor as the train moves off to the next station. There is also a "results" page, which allows you to email results from each station for your personal records. I've really been enjoying using this app so far, and it has been well received by the little ones in my practice. They love filling up the train, and I've also transferred it to my Thomas train set activity which allows us to sort items around the clinic. As a therapist what I would suggest to the developers is the ability to add more categories. This way, as children master this level there is the opportunity to have 3 or 4 categories at one station, to make it more challenging. If you think that this app sounds like it's for you, you can pick it up here on the iTunes store. Our lovely friends at Therapy Box were kind enough to provide a copy for me to give away. You can enter below with Rafflecopter. The winner will be announced next Tuesday! *UPDATE* We have a winner!! Congrats to Kathleen for winning a copy of Sort This Out Pack App. I hope you enjoy using it in therapy! For these moments when my mind rambles into a Facebook post, and I think to myself...."Hey that's a blog post right there...."
Today, I had the pleasure of hosting my first Aphasia group, with two young ladies who had suffered from strokes within the past few months. They both have moderate aphasia, with only mild comprehension deficits, nonfluent speech, difficulty with confrontation naming, and significant word finding difficulties. This was the first time they had ever met, and you could tell they were both quite nervous. However, as we were doing the icebreaker activity, when one started to talk, the other suddenly exclaimed "She talks like me!!!" and they both burst into giggles. That was all the icebreaker they needed. They had a lovely session, where they encouraged each other, helped cue each other (I was like who's the therapist here now? ), gave high fives, and even ganged up on me. It was so good to have that support of someone who was experiencing the same difficulties, who could be patient while waiting for them to get out the right words, because they knew the frustration of knowing what to say, but just not being able to get those words out. Hearing things like "It's ok I have that problem too," "Come on, you can do it," "Don't give up," made me so proud of these two. We were able to do so much more than in an individual session, for example individual therapy sessions are usually based on answering questions, and today I was able to tap into difficulties/strengths in asking questions. By the end of the session they had created a new friendship, made me take their photo together, and exchanged whatsapp information to maintain contact. 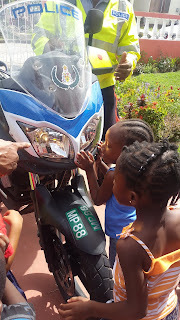 It was such a blessing to be able to not only help them regain their language skills, but also to provide for them the support of another person who truly understands what they are going through. I'd recommend for any therapist to host an aphasia group and see the impact it has on your clients, and also on you as a professional, and a person. 1. Icebreaker- Participants were required to take turns asking each other and asking questions about themselves. Questions chosen ranged from "what is your name?" to "Do you have a boyfriend?". (They chose the questions not me). 3. Guessing game- Used functional pictures from the LARK and played a game where one had to use the strategies they have been learning in therapy to describe a picture of an object (e.g. what does it look like, what is it used for etc. ), and the other person guess what it was. I'm a Speech and Language therapist, ready to share and learn about communication disorders and great intervention ideas.